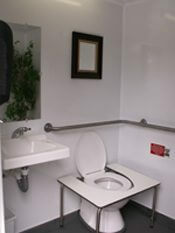 The Royal Restrooms ADA Plus Two-Stall portable bathroom trailer rental is designed to accommodate weddings and larger groups of people, and is one of the only mobile restroom trailers on the market designed for individuals with disabilities; perfect portable toilets for weddings. The ADA (Americans with Disabilities Act) unit conforms to all applicable portions of the ADA Accessibility Guidelines (ADAAG). In addition to being preferred portable bathrooms for weddings and large public events, these restroom trailers are perfect for certain business remodels requiring restroom facilities that meet ADAAG requirements. This unit may be combined with additional Royal Restrooms restroom trailers to serve events such as festivals and fundraisers. 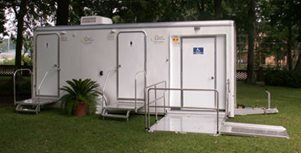 Mobile restroom trailer rentals are also ideal for serving those in need during emergency situations, disaster relief efforts, or in any case where power and water sources are not readily available. 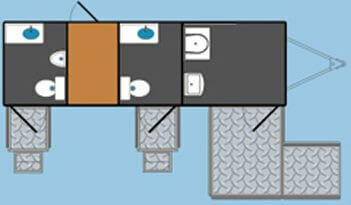 Our wedding portable bathrooms can help to streamline the event completely. The unique design of Royal Restrooms mobile restroom trailers, portable bathrooms for weddings and portable bathroom rentals gives them the mobility to go virtually anywhere. The ADA Plus Two-Stall Unit is completely self-contained and is operable using a 110 volt outlet or generator for the lights and heat or air conditioner. (Unit pulls a maximum of 20 amps.) Water is supplied to portable bathroom rentals by a spigot and garden hose or a 125 gallon on-board fresh water holding tank. The unit houses a 450 gallon waste holding tank. 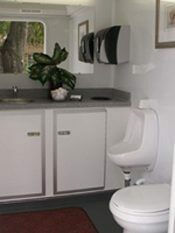 Rental options for mobile restroom trailers and portable bathrooms for weddings include daily, weekly, and long-term rentals, generators, additional fresh water holding tanks, and restroom attendant. Pricing and availability may be obtained by contacting your local Royal Restrooms office at one of the phone numbers to the right, or requesting a quote right now.